One artist calls her work “stitched drawings.” Another prefers the term “art quilts.” And if you asked the 23 other artists who contributed to the Cal Poly University Arts Gallery’s exhibit, A Tear in the Fabric: The Conceptually Driven Quilt, you’d probably hear a few more terms. It’s not that these women want to spend their time quibbling over semantics. But many of them have spent years—decades even—studying fiber art. They’ve acquired degrees. And they’re armed with the knowledge that their art is steeped in more than 700 years of history, linking them to countless women throughout space and time, a meandering, patchwork of people and experiences large enough to blanket the Earth several times over. But this lengthy history isn’t enough to elevate quilt-makers above the craft-versus-art debate. Hence the profusion of labels. Carolyn Mazloomi, founder of the Women of Color Quilter’s Network and curator of many a fiber art exhibit, is often credited with organizing quilt collections that transcend the question of art or craft. Her own work has been exhibited in dozens of venues from the Los Angeles Folk Art Museum to the National Afro-American Museum and Cultural Center. She’s also published several books in conjunction with her curated exhibits, including Textural Rhythms: Constructing the Jazz Tradition, Threads of Faith: Recent Works from the Women of Color Quilters Network, and Spirits of Cloth: Contemporary African American Quilts. If it’s not yet apparent, the fact that A Tear in the Fabric is not your standard quilt exhibit bears emphasizing. If you were to visit the gallery expecting orderly rows of alternating squares that bespeak of apple pie and the good ol’ days, you may be in for a bit of a shock. The phrase “conceptually driven” is part of the exhibit’s title for a reason. Some of the art quilts express a rage that calls to mind a seamstress violently wreaking a path through a maze of fabric with her sewing machine. A few are sad. Still others are contemplative. 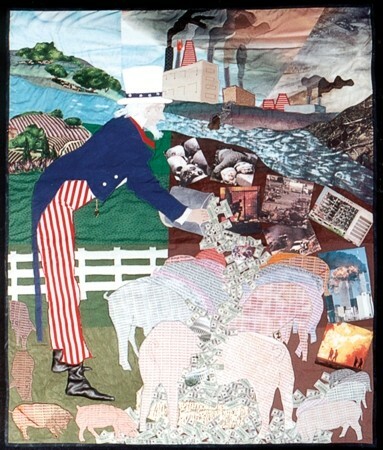 Susan Krueger began her piece, Pro Patria, in response to Operation Desert Storm in 1991; in 2004, in response to the second President Bush’s Operation Iraqi Freedom, she turned her attention to the unfinished quilt, completing it in 2005. The finished piece, which bears the phrases “WAR IS NOT THE ANSWER” and “BE A VOICE FOR PEACE,” has a surprisingly active political life as a banner at anti-war protests. 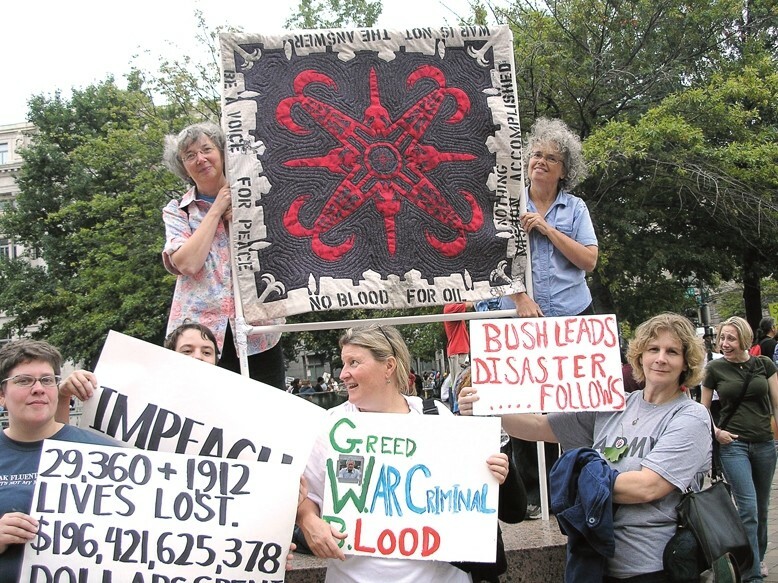 PRO PATRIA : Susan Krueger's quilt serves as a banner in an anti-war protest. Nancy Erickson’s quilt, Patience, is part of a series expressing her grief at the slaughter of a pack of wolves in Alaska’s Denali Park. Size Prison is Jeanne Surber’s response to the distorted body image that society inflicts on women. Quilt artists explore the political tension in Jerusalem, the potentially criminal activities of the high fashion world, capital punishment, and the relationship between Native Americans and more recent inhabitants of the United States. 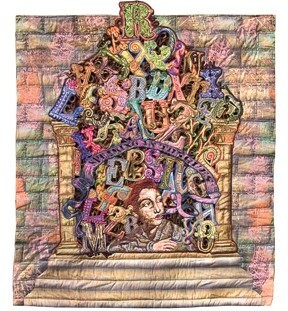 The death penalty is such a provocative issue that two of the artists addressed the topic in their quilts. Jane Cochran, a resident of Rabbit Hash, Kent., was one of them. 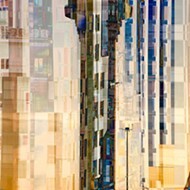 Originally, Cochran’s artistic canvas was just that, canvases on which she would paint; she refers to her style as that of an abstract expressionist and her technique as that of a “paint flinger.” In 1978, she began making small-scale fabric collages, and in 1985 she completed her first large-scale project, a labor-intensive art quilt, the kind of piece she still enjoys working on today. 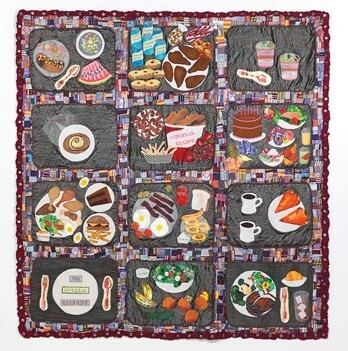 Cochran derives ideas for her art quilts from the fluff and nonsense of everyday life, much of which directly relates to small-town living. For example, one of her quilts (which won’t be making an appearance in the exhibit), Legacy, was inspired by the fact that her black lab, Junior, is the official mayor of Rabbit Hash. As is the case with any good old Kentucky election, Junior won the vote by receiving the most money: $1, one vote. But the piece that made it into the University Art Gallery’s exhibit was inspired by a television segment about last meal requests prior to execution. 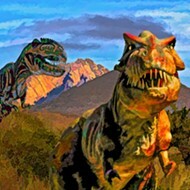 Cochran pondered what her own last meal might be, were she in the position to decide. So she researched actual last meal requests and, as the summer of 2007 began, started beading them into a traditional block-pattern quilt. Rebecca Ringquist is another artist who works to give her viewers pause, though she calls her think pieces “stitched drawings.” Like Cochran, she began her artistic career in another creative genre: as a photography major at the School of the Art Institute of Chicago. Once it became clear to Ringquist that material was a tool through which she could tell stories and express her views and thoughts, her photography days were over. In 2003, she earned her MFA in fiber and material studies, and she now teaches fiber art classes at the School of the Art Institute of Chicago. Working with found embroidery, including materials that she liberated from flea markets and thrift stores, Ringquist spent a year hand embroidering and machine stitching Garden Gate, one of the pieces in the Tear in the Fabric exhibit. The work is a pictorial response to her grandmother’s eighth grade graduation autograph book. Within the book’s pages, now more than half a century old, Ringquist discovered quaint sayings and bits of advice that schoolmates had written for her grandmother. 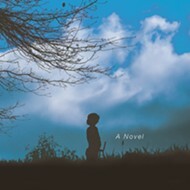 “One said, ‘Don’t make love over the garden gate, love is blind but the neighbors ain’t’—and I think it’s such a strange thing for one eighth grader to write to another,” she said. And while the phrases struck her as bizarre, Ringquist re-evaluated the quote from a more modern perspective, that of a citizen of a surveillance society. Based on these two quotes in particular, Ringquist embroidered a lush garden setting, overflowing with flowers, leaves, and birds with a bed at the garden’s center, flames licking their way up the mattress. 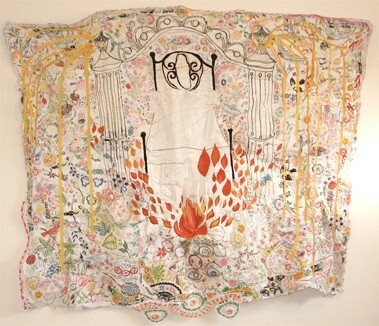 By incorporating her found embroidery pieces, Ringquist deliberately intertwined her own contemporary perspective and commentary with old-fashioned decorative items that have their own story as well, literally and symbolically layering the stitched drawing. Though Garden Gate was completed in January, it’s already exhibited at the Hyde Park Art Center in Chicago. There. I’ve offended the entire poetry community—as well as anyone else endowed with both eyes and good sense—on behalf of the conceptual quilt exhibit. A Tear in the Fabric: The Conceptually Driven Quilt runs through June 14 at Cal Poly’s University Art Gallery, located in room 171 of Dexter. The gallery is open from 11 a.m. to 4 p.m., Tuesday through Saturday, and 7 to 9 p.m. on Wednesdays. An artist’s reception will take place May 16 from 6 to 8 p.m.
Arts Editor Ashley Schwellenbach keeps herself in stitches. Tell her how un-funny she is at aschwellenbach@newtimesslo.com.